Set in the beautiful Conwy Valley on a 16 acre family-run small holding, Cae Wennol offers a quiet retreat and a gateway to Snowdonia's mountains and coast. Cae Wennol is the ultimate Glamping experience with 3 yurts in a secluded 2 acre field overlooking beautiful eco ponds rich in wildlife. 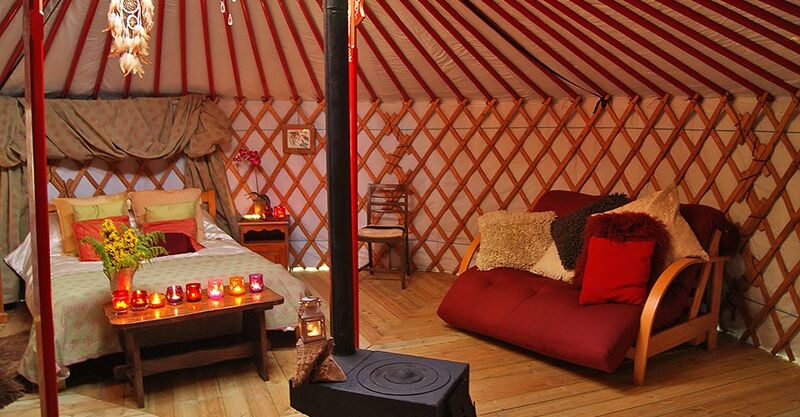 Seren is a traditional Mongolian yurt that sleeps 2 adults and 2 small children. 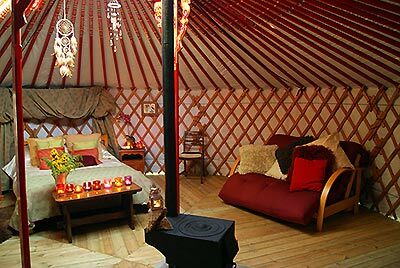 This yurt is ideal for a romantic break. 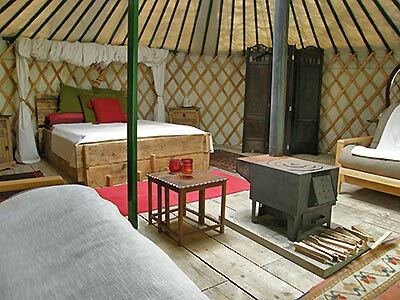 Seren is a traditional Mongolian yurt that sleeps 6. This yurt is ideal for families. Cae Wennol Yurts is situated in a peaceful spot up the Conwy Valley, just a few miles from the medieval walled town of Conwy. At the edge of the Snowdonia National Park, this is an ideal location from which to explore North Wales. View the local area page for information on the many activities and attractions in Snowdonia and North Wales that you can enjoy during your glamping holiday in the yurts. 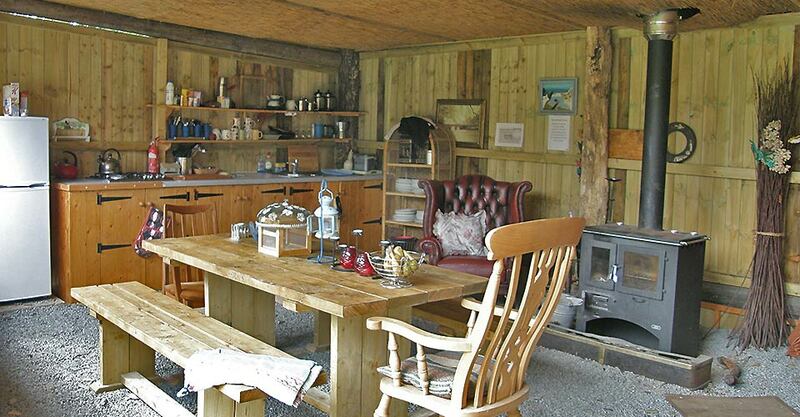 The guest comments shown on this page are from the Cae Wennol Yurts TripAdvisor page.
" 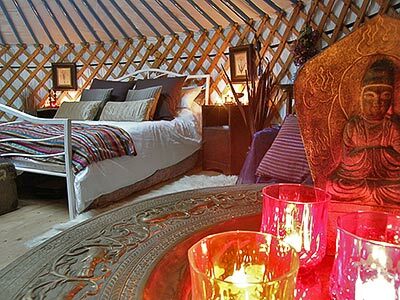 Beautiful yurts and cosy and warm with the log burners. The kids and dog loved it here exploring the pond area. The shared kitchen area is fantastic with everything you need including herbs! Clean toilet and showed and avril is a fantastic host. We cannot wait to go back. " 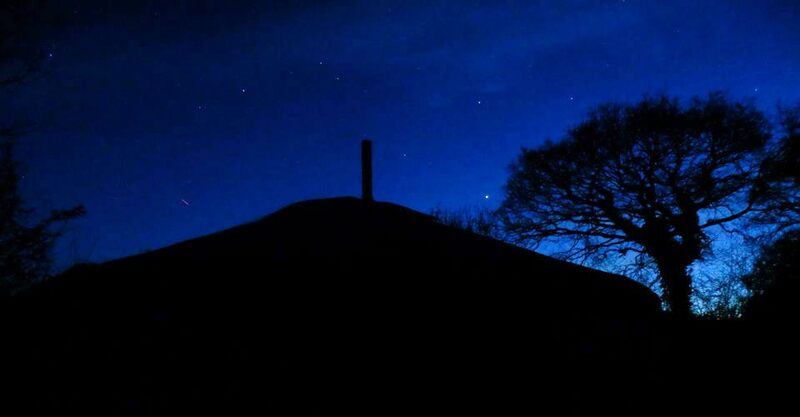 " We came back to Cae Wennol once again this year, complete with the children and nieces. As usual, everyone had a lovely time - a beautiful location, very relaxing and a lot to do in the surrounding area. " " This is an absolutely fantastic camping spot that I cannot recommend highly enough. Just back from a visit...Avril the host is very friendly, the yurts are well equipped with plenty of warm blankets and cushions and soft lighting and the log burner soon warms them up. They are cosy, comfortable, spotless and well located. " 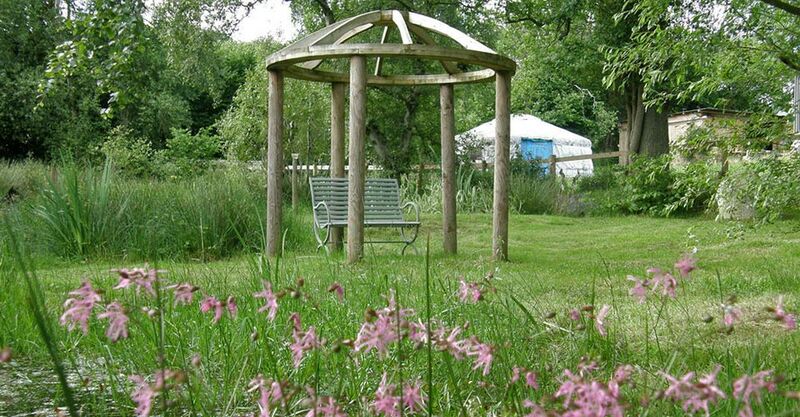 " Really pleased I found this gorgeous little glampsite. The yurt we stayed in (Seren) was absolutely lovely, as were all the communal areas. Really great to have our own loo and sink as well. " "I cannot thank Avril and her son enough, my 3 children and bichon did not want to leave we had a very special few days and will be returning very soon. The location is beautiful you can relax then enjoy the sights nearby .Amazing!!!! Top of my list for Glamping! " " Just returned after spending 4 nights in the hedwych yurt not our first experience of glamping but definitely the best. Our girls thoroughly enjoyed it and the mother in law at 77 found it a great experience. " Content is copyright Cae Wennol Yurts, Snowdonia, North Wales.